Monster Ronson's Ichiban Karaoke: The Brian Tennessee Claflin Foundation & Random Records present PRIX! The Brian Tennessee Claflin Foundation & Random Records present PRIX! Do. 1.12.16 - SAVE THE DATE ! 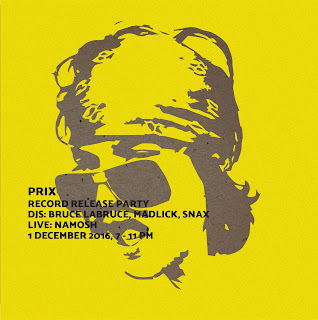 At long last...the first release from the late Brian-Tennessee Claflin's musical alter ego, PRIX! Between 2009 and 2013, Brian and Snax produced music and sound collages for Brian's performance work, meeting somewhere at the intersection of dance, voodoo, bitchiness and punk. Continuing their efforts to present and promote Brian’s work after his tragic death in 2014, the Brian Tennessee Claflin Foundation is proud to release two tracks from these sessions, 'Don’t Get All Upset' and 'Spritz It', together with remixes by Bruce La Bruce vs. MADLICK and Lotic. This vinyl release will be launched on the eve of Brian’s birthday, 1 December, at Monster Ronson's Ichiban Karaoke with a live performance by Namosh, DJ sets by Bruce La Bruce, MADLICK and SNAX - musician - and a very special exhibition of two simultaneously played documentaries, exploring the creative process of Brian and Snax in the studio. The PRIX EP, limited to 500 hand-numbered copies with cover art designed by Mario Dzurila, will be on sale during the night with all proceeds going to the Brian Tennessee Claflin Foundation. Karaoke versions of each track will also be premiered for your singing pleasure. Come celebrate with us the ‘majesty of PRIX’ ! FREITAG 18.11.16 ab 21 Uhr -- THE HOUSE OF PRESENTS: DRAG SHOW! + SING ON STAGE with SHREDDER ab Mitternacht! I promise to tip my bartenders generously! KILL YOUR HANGOVER! Come early for a swing dance and then later get back up on stage with RIPSY & the monsters!